Germany is an incredible backpacking destination with exciting culture, a lot of history, diverse cities and cute small towns providing plenty of reasons to go. Combine colourful festivities, ancient castles, modern nightclubs, lush forests and vast mountains and you have a truly amazing country that can cater to every backpacker’s needs. But where to start and – most importantly – where to sleep? No matter if you’re visiting the port city Hamburg, the carnival capital Cologne, the alternative Berlin, the Bavarian Munich or the small cities in-between, they all have an enormous choice of places to rest your head, meet other backpackers or simply pitch camp. Hostels are a great way to meet like-minded travellers and Germany has the perfect option for every kind of trip. So, no matter if you plan on heading out solo, travelling with your significant other or are looking for a little me-time, let us hand the best hostels to you on a silver platter – right here, right now! You can call it a hostel, café, bar or theatre: Die Wohngemeinschaft is many things to many people. You’ll be spoilt with delicious coffee and pastries in their café, which by night turns into a bar with an upbeat atmosphere, DJ tunes and signature beer. Enjoy concerts, plays and films and soak up all of Cologne’s cultural variety without even leaving your hostel in their very own theatre (yes, it’s theirs and it’s awesome). You won’t have a single minute of boredom! If you put ’Die Wohngemeinschaft‘ into a translator, the word you get is ‘flat-sharing community’. With an unbeatable atmosphere and world-class hostel events, it’s the kind of place a solo traveller dreams of. Köllefornia, here we come! The Grand Hostel Berlin Classic is not your ordinary hostel. As a HOSCARS 2016 winner of the title ‘No. 1 Hostel in Germany’, you can’t go wrong. How did it win this title? That’s easy: Being in a top location right in the centre, the Grand Hostel Berlin is a cheap place for great indulgence. Majestic luxury isn’t always easy to come by when you’re on a budget, but here you can enjoy the stunning historical setting without breaking the bank. Meet fellow travellers at the Grand Family Dinner and head out to the best places on the Grand Bar Tour, a unique way to experience Berlin’s nightlife. As one happy traveller said: “The facilities are top notch and the atmosphere is ideal, especially for a solo traveller looking for some diversity. It’s rare for such a big space, but this place feels like more than a hostel. And this is coming from a former hostel manager. Stay here!” We’ll take him up on that. Lollis Homestay prides itself on being a genuine backpacker’s hostel, offering the best possibility to meet like-minded travellers from all over the world by adding an extra portion of personality and cosiness. It offers its guests a free dinner on Sundays, free walking tours and games nights, meaning there are many opportunities to mingle. Dive into a home-like atmosphere and enjoy the best of Dresden as the hostel is close to great bars and cafés. The info board has all the information you need, so when you’re ready to explore just grab a free bike and enjoy Dresden on two wheels. Velvet is blue, this hostel is white and one thing’s for sure – you will have a great night! With a mix of red bricks and white walls, white beds and bright floors, the Hostel Multitude is just too photogenic. Clean rooms, comfortable beds, a thoughtful interior and a sun-drenched beer garden will make you one happy traveller. Talk to the friendly staff and be sure to ask them about the best things to see in Leipzig to explore the city like a local. 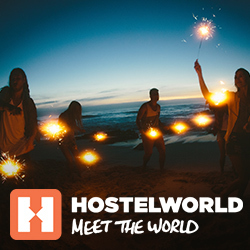 Travel quiz: what is a classic hostel activity, one of the most popular hostel events and the best way to mingle with fellow backpackers? We know it’s a no brainer and the answer – of course – is a beer pong and flip cup night. Those nights never disappoint, especially if they’re on the 7th floor in an amazing hostel rooftop bar, like the one in Wombats City Hostel Berlin. The famous chain is popular among backpackers and this one in Berlin stands out. It’s in the vibrant district ‘Berlin Mitte’, close to amazing sights and the hub of Alexanderplatz. Enjoy the location from the amazing rooftop with a view and visit the womBar on the seventh floor if you’re ready for a game. If you’re a fan of little perks and extras, this one is for you. Bike rental, happy hour, umbrellas and hairdryers ensure you enjoy personal comfort at its best. Another amazing thing about this hostel is its great atmosphere in the large outdoor BBQ area and garden. Did you ever see a barbeque where people didn’t mingle and have fun? We thought not! Have a great chat over a beer and grilled food with people that will soon become friends. After all, the way to love and friendship is through the stomach, right? Nestled in an old town, next to rivers and mountains, behind valleys and forests and overlooked by an ancient castle, you will find an old house. Once owned by a girl called Lotte, this house is now home to free and adventurous souls from all over the world. Welcome to Lotte – The Backpackers in the iconic Heidelberg, a must-see if you’re travelling Germany and are keen on unique experiences and picturesque castles. The magical town has a young vibe, as Heidelberg is one of Germany’s major student hubs. It won’t take long until you find yourself in a group of welcoming travellers, exploring the vibrant bar scene and wandering up to the castle and the hills as many philosophers did in their days. Did you ever look into an urban architecture and design magazine and get the urge to try one of those rooms out one day? If the answer is yes, we’ve got good news. The unique Lekkerurlaub Hostel in Berlin is an alternative design lover’s sweet dream. Stay in a loft bedroom, enjoy the comfortable beds and adore the quirky interior. The hip area offers a lot to explore, and their breakfast is delicious, with plenty of vegan-friendly options. Perfect for the backpackers that aim to spruce up their feed with a bit of colour (and a hint for all the Instagram boyfriends out there). The Hostel Blauer Stern in Leipzig takes urban-chic to a new level. Each room glows in a different colour with its own retro style interior bringing you right back to the 60’s. A cosy and relaxing garden will make you twist and shout with happiness and after enjoying more artsy activities in the surrounding galleries, theatres, weekend markets and pubs, you’ll soon be singing ‘be my, be my baby’- whether it’s to your partner or the hostel. Travelling can confront you with a tough question: should you choose the hostel that gives you all the backpacker fun while even saving some money, or is it time to treat yourself with privacy, comfort and a room for two? Don’t worry, we have the perfect answer – the Five Elements Hostel Leipzig. Stay in a private room and enjoy some togetherness while staying within your backpacker budget. Meet new people in the kitchen, the common area or during the hostel dinner on Wednesdays and start the night in the on-site bar. It’s up to you if you feel like date night or meeting new people! Berlin is famous for its vibrant party scene and various bars and clubs, though guests at St Christopher’s Berlin claim that ‘It’s very easy to find yourself staying in the hostel all night because there’s a party every night‘. It’s the place for everyone who not only wants to be where the party is happening, but also sleep there, enjoy a great atmosphere, meet new people and just have a few stairs between the party and their bed, making getting home the easiest task in your new city. Who are we? Travellers! What do we want? A great hostel! Not enough? How about a great hostel with a bar? Throw in a highly praised all you can eat breakfast, hammocks, bean bags, and a glass-roofed courtyard to enjoy the outside no matter if the sun shines or rain pours. Now we’re talkin’… about Wombats City Hostel in Munich! Not to mention it’s just a stone’s throw away from the famous Oktoberfest for all you party animals. So, is this the hostel we want? Yes, yes indeed it is! Hostels are the best place to have an amazing time and meet new friends, especially when they offer great activities to mingle. In Five Element Hostel in Frankfurt, activities take place almost every night of the week, starting with crêpes on a Monday, then Trivia nights on a Thursday, free beer on a Friday (you are in Germany after all), games on a Saturday and a recharging movie night on a Sunday – and then, repeat! We’re not sure what their 5th element is, but we heard through the grapevine it has something to do with fun. With the best nightlife around, it’s hard to doubt that rumour! Is it a hostel? Is it a comfortable home away from home? Well, it’s both! Viertelvier is a Berlin boutique hostel with a homely feel that lets you dive into the city’s vibe while feeling like you’re slowly becoming a resident. You will have your own room and personal space while the staff keep you up to date about the best sights and secret tips. Check in and live like a real local, and you might start believing that Berlin is your home. A brand new option to check out Germany’s beachside (yes, that’s a thing). The owner himself backpacked many times until he put all his adventures and experiences in to fulfilling his dream and opening a hostel in Germany’s maritime gem Warnemünde. And what would be a better way to live the life by the beach than staying in a real, super stylish, private sea container? Not to mention it has a container sauna, lots of goodies, themed rooms and a fun games area with plenty of activities. Dock Inn Hostel in Warnemünde is one of a kind and you can experience it now. Ahoy! If we know one thing, it’s that the Meininger hostels do private rooms right. Enjoy luxury and comfort while paying hostel prices and staying in Leipzig’s centrum, close to all the sights and main activities. Explore, return, rest and enjoy – simple as that! Plus Berlin offers a unique experience nestled inside a historical building. Spotless rooms with fresh towels are just the starting point for this great value hostel. If you like to pamper yourself or relax and switch off in a buzzing city like Berlin, an indoor pool, a sauna and a lush garden might fit the bill. Yes, it’s a hostel, it’s a historical former school and it’s a spa – and it won’t break your bank! There are beautiful interiors, there are design and art galleries and then there’s Hostel & Garten Eden, which combines it all! With every room, guests step into another artistic masterpiece of interesting furniture and thoughtful designs. The only downside is that you will probably want to sleep in all of them, but who says you can’t stay and try them all? PS: Their garden is just as beautiful. To quote Lonely Planet: ‘This tiny hostel is as warm and welcoming as an old friend’s hug thanks to its wonderful owners …It’s at the heart of in-again Kreuzberg, near a scenic stretch of the Landwehr canal’. Besides the great atmosphere, you should look out for Enrico, as he will give you the best tips and is described as ‘the kindest person in the world’. Close to the main attractions and equipped with the best information about Berlin, you’ll be more than ready to have a great time here. Where is Fuessen, you ask? Well, you might have heard of the famous castle Neuschwanstein, one of the top sights in Germany and real proof that back in the day design and aesthetics were already a big deal. If we’re talking about modern aesthetics however, the Old Kings Fuessen Design Hostel doesn’t do a bad job at all. It’s a comfortable place to stay, live like a prince or princess and enjoy modern interiors before stepping back to the ancient architecture and magical castles of the old days. We know you can’t wait to head to Germany now and we hope that with these tips, you can find your perfect hostel-match. Have you stayed in any of these hostels or do you have a recommendation that other travellers need to know? Tell us in the comments!